As I prepare to head to a Jack and Jill tomorrow for some friends, and some of my recent clients, I thought now was as good a time as any to cover a topic I’ve been asked about in the past. Why book an engagement session? That’s a really great question and I’m about to give you some really great reasons. Engagement sessions are a great way for the photographer to get to know the clients and get an idea of their style before the big day. It’s also a great way for the clients to get to know the photographer and build a relationship, which I believe leads to a much more relaxing partnership on the big day. A great example would be my recent session with Alysha and Will. Now, granted, I’ve worked with these two in the past, but I did bring along Melissa from Colors of Her Heart Photography for the engagement session. It was a wonderful opportunity for me to feel out what shooting with Melissa would be like and, even better, it was a chance for Alysha, Will and Melissa to get to know each other. We all worked together so well that we’ve already agreed to have Melissa as my second shooter for the wedding, which I’m super excited about. Another great reason to book an engagement session is because many couples like to send out save the dates. You can use one, or several, of the photos from your session for your save the dates. Friends and family will love seeing your photos on them and it makes for a nice keepsake to hang on the fridge, in the office, or place in an album. I’ve also had clients use them for technology free announcement cards. 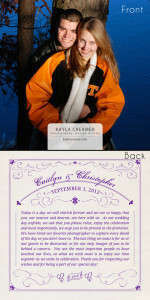 Below is an example of the cards from Caitlyn and Chris’ wedding. Click the photo for a larger version. Again, another little keepsake that guests will love. Technology free ceremonies are another topic which I’ll be covering another time, so stay tuned. An example of camera/technology free announcement cards. A great keepsake for guests and a friendly reminder that you’d like them to be present in the moment and save the photography for the hired photographers. I’ll post a photo later, but photos from an engagement session also work great for sign in albums. Say goodbye to the standard sign in album with lined pages for guests to sign. Your engagement album can have great photos from your engagement session on each page. Your guests will love looking at your photos and it’s a great keepsake for you, with a combination of your photos and messages from friends and family. 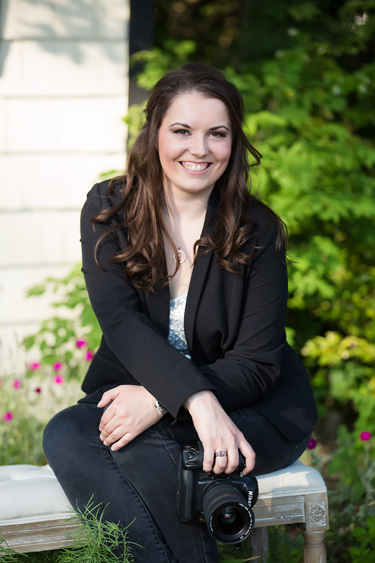 In case it needs to be mentioned…One more reason why you should book an engagement session…Because they’re fun! I guarantee, you’ll have a blast!